Leah has been covering the unfolding drama at the Consumer Financial Protection Bureau, a powerful and shockingly unaccountable agency designed by Elizabeth Warren created by Democrats' Dodd-Frank bill. 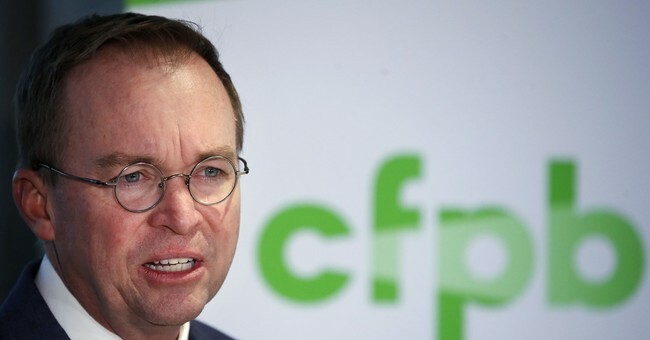 Its longtime director -- who, finally, was legitimately confirmed in 2013 after President Obama's unconstitutional and unanimously-overruled 2012 recess appointment -- resigned from the CFPB late last week, ahead of an expected gubernatorial run in Ohio. Some legal questions are tough. The question of who should lawfully be considered the acting director of the Consumer Financial Protection Bureau is not one of them. President Trump unquestionably has the power to name Mick Mulvaney (his Senate-confirmed budget director) to the position, and he has done so. The lawsuit seeking to block this appointment, filed by the CFPB’s deputy director Leandra English — who hopes to take the job herself — is frivolous and offensive...Cordray was quite explicitly attempting to ensure that he, rather than the president, would choose his successor. Under the aforementioned CFPB statute, the deputy director serves as the director “in the absence or unavailability of the director.” Cordray was paving the way for English to argue that his resignation as director creates an “absence or unavailability” that makes her the director as a matter of law. Interestingly, English is being represented by private counsel. According to Reuters, CFPB general counsel Mary McLeod, who was appointed by Cordray in 2015, thinks the Trump administration has the stronger legal claim and has written a memo to this effect. Got that? CFPB's own lawyer is siding with the Trump administration in this fight, which is why Ms. English was reduced to obtaining outside counsel in her lawsuit. Mary McLeod was hand-selected by the recently-departed, aggressively 'left-wing' director, who heaped praise upon her "tested judgment" and "wealth of experience" in 2015. The law is pretty clear in this case, yet many Leftists are latching onto this quixotic stunt as their latest means of signaling hair-on-fire "resistance" to the Trump presidency. They frequently lament how the president's actions are "NOT NORMAL!" and shouldn't be treated as such. Well, attempting to usurp the president's statutory power to fill executive vacancies is not normal. I wonder if the folks trying to block Mulvaney's designation as Acting CFPB Director realize that this episode actually *highlights* why the Supreme Court should hold the CFPB's structure unconstitutional, as the DC Circuit panel did in PHH v. CFPB. The people defending this scheme look very silly.